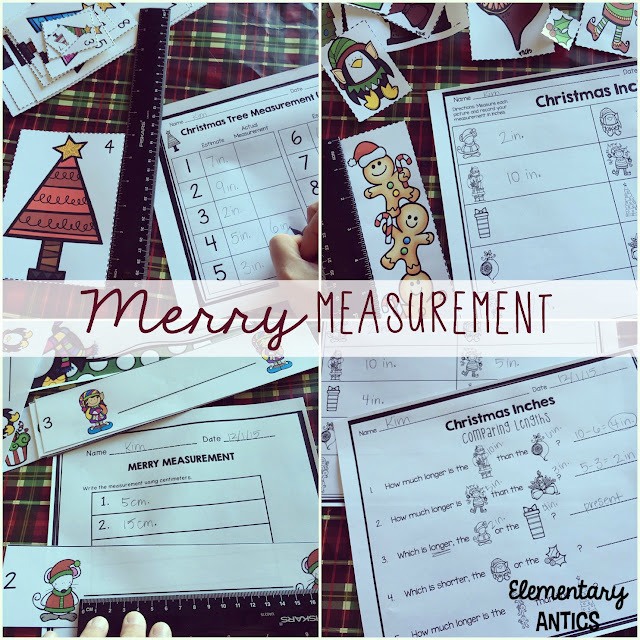 Counting Down 'Til the Big Day: Holiday Themed Math- Merry Measurement! Today it's all about Holiday themed math activities! 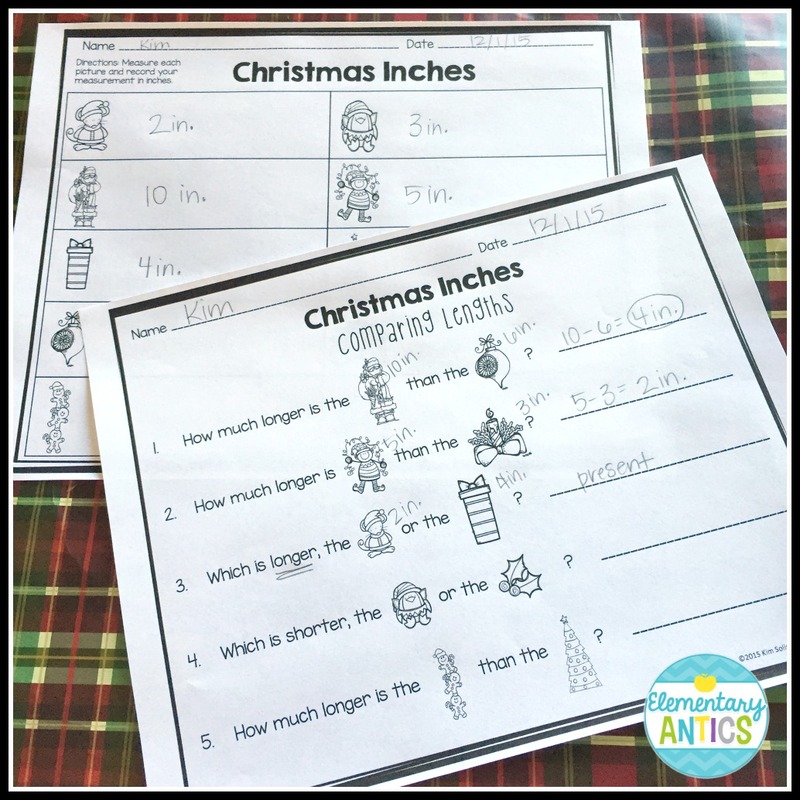 Depending on my districts learning schedule, I seem as though I am often times ending up either finishing up or smack in the middle of my measurement unit right when the holidays get into full swing. So, because of this I try to find ways to incorporate the holiday spirit in some of my activities. 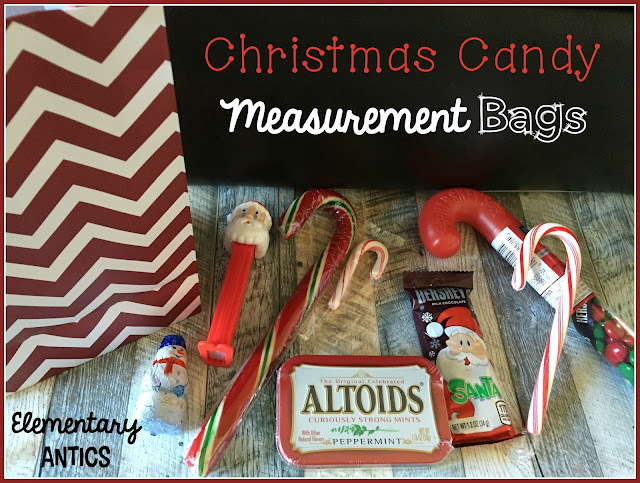 One year I decided to do some Christmas Candy Measurement Bags as a fun center for my kiddos! All I did was gather some holiday themed candy, stick it in a Christmas bag, give the kiddos some rulers and - viola- a fun measurement center! Depending on the grade level or needs of your students you can have them measure to the nearest inch, half inch or quarter inch, or to the nearest centimeter. Just a sample of some candy that I used. This was great because they were able to practice measuring things that weren't the "perfect" inch or half inch or centimeter and they had to use their knowledge and judgement to decide the length of the items. Now, if you are just getting started with measurement this may be difficult, so you might want to find candy items that will be appropriate for your students to measure. You can also differentiate this for your students' needs using different items or how you have them measure! If you find yourself in need of some more holiday measurement activities you can check out my Merry Measurement- it's three Christmas themed activities to help your students with measuring inches and centimeters. 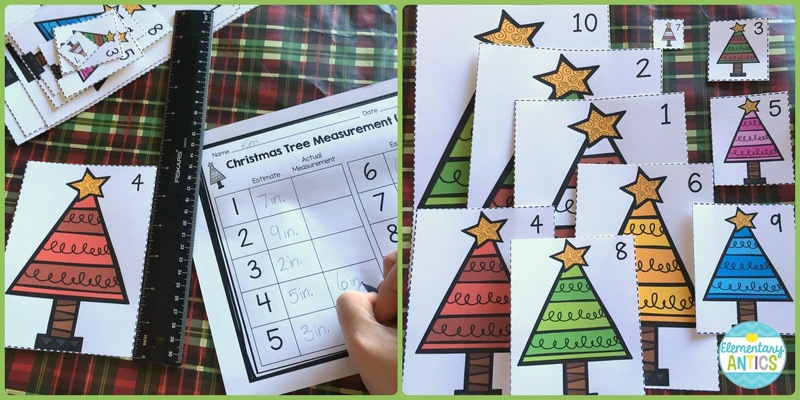 This first activity included is Christmas Tree Measurement. One way to use this in your classroom is to do some measuring around the room. First, laminate and cut out the 10 Christmas trees. 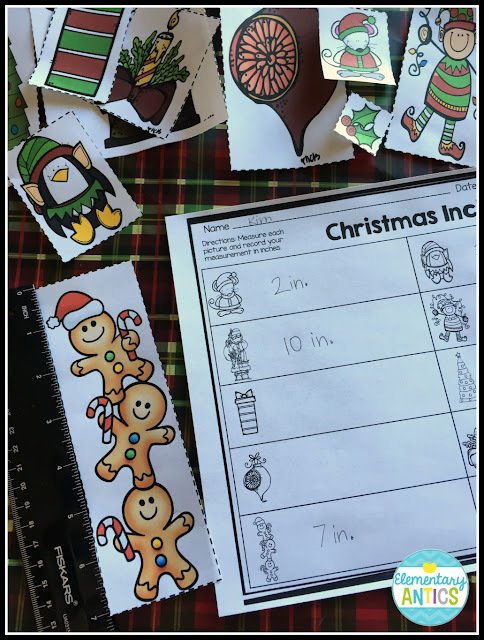 Then, I like to tape them up around the room for students to find (I usually make 2 sets so that there a couple places for the kiddos to measure and it doesn't get crowded anywhere). Students first will estimate the height of each tree and record their estimate. Then they will measure how tall each tree is and record their actual measurement. You could also just use this as a simple measurement center or rotation. 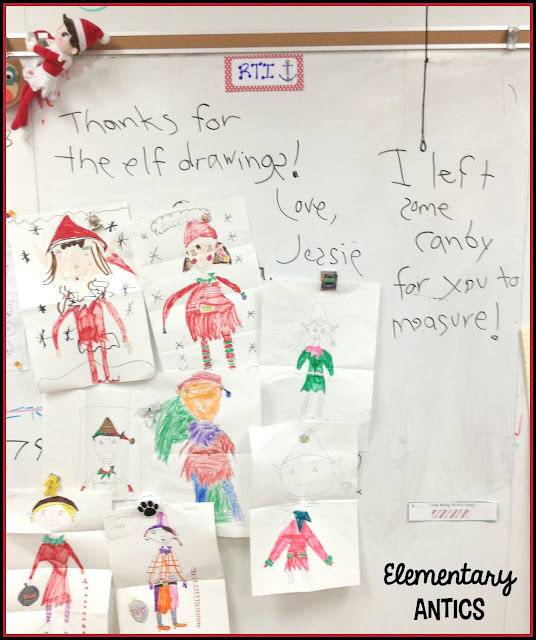 I've also done something just like this where my class elf, Jessie, left peppermint candy all around the room for the kids to measure. Not real candy, but paper peppermint sticks. Although Jessie did leave each kiddo a candy cane too! Next up is Christmas Inches. This is a great fun activity or center! First, cut out and laminate (for durability) each holiday picture. Then, the students will measure the height of each picture and record their measurement on the recording sheet. There is also a questioning worksheet on comparing the lengths of the pictures included. Last up is Merry Measurement. Students just measure each line from one holiday character to another using centimeters and record each measurement on their recording sheet. 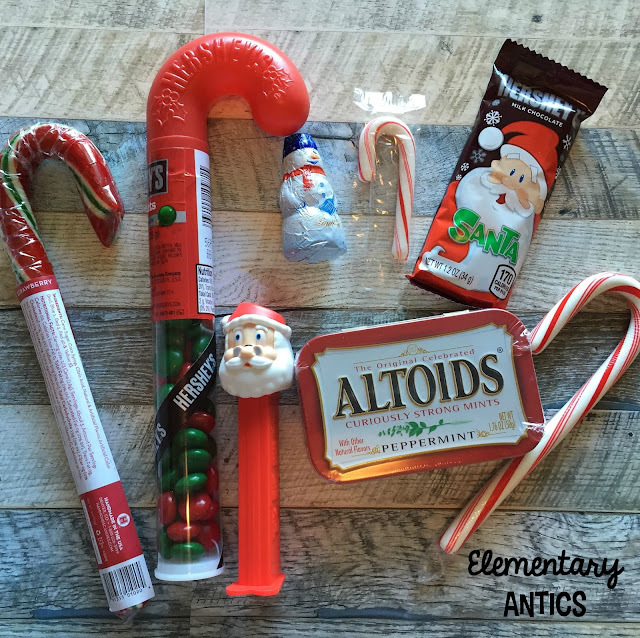 A super easy and fun center or activity! Kim, I love your measurement activities. Great way to cover Common Core while the kids have fun and learn too! I just know kids will love both ideas. Kim, thanks so much for joining us for Day One of our linky party! I love all of these activities. My favorite is the little measurement bag you created. It is so simple and easy to implement...perfect for the busy holiday teacher. 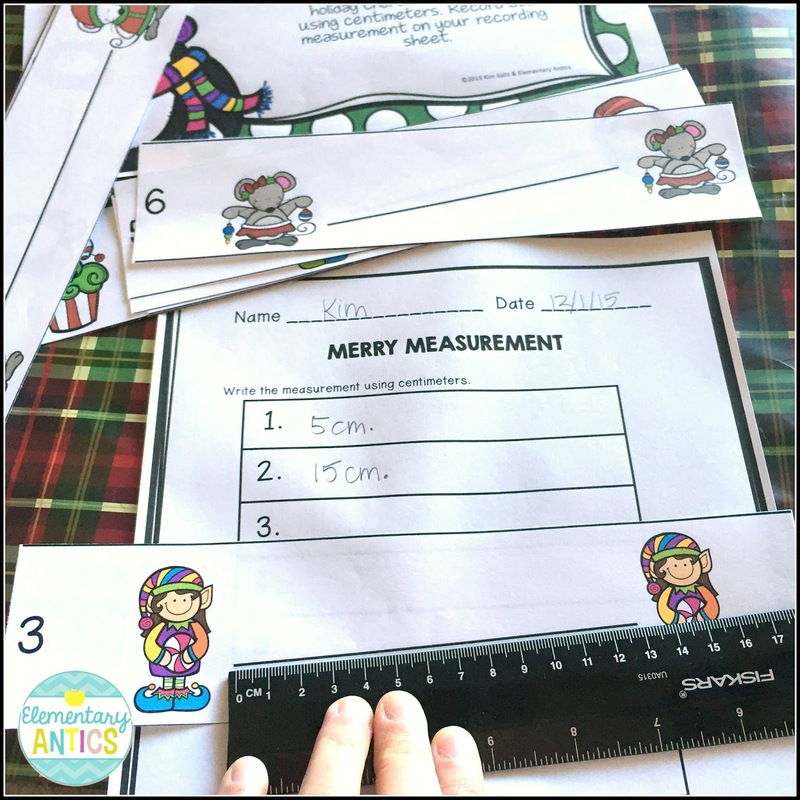 I love that when you are finished with each of the festive measurement tools, you can distribute them as a fun treat to the students! Your ideas are so creative! I love that you had the students measure Christmas candy. So much fun.